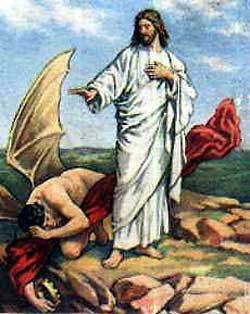 Jesus overcomes Satan by quoting the Word of God to him. OU REMEMBER THE story about the beautiful Garden of Eden, where the first man and woman lived when the world was new. And you remember about the visit of the tempter, who came into that beautiful garden one day and persuaded Eve, the woman, to do wrong. Before that time there was no sin in the world; but after Eve listened to the tempter and obeyed his words, sin crept into her heart. And then Adam, the first man, also obeyed God and allowed sin to creep into his heart. Because sin found a place in the hearts of the first man and woman, sin was born in the hearts of all their children. And for this reason God sent Jesus, his dear Son, into the world, to save the people from their sins and to wash away the stains sin had made. Satan, the tempter, knew about God's plan to save people from their sins through Jesus. And he tried to spoil God's plan just as he had done before. He tried to crowd sin into the loving heart of Jesus. After the baptism at the Jordan River, when God's voice spoke from heaven and said, "This is my beloved Son," Jesus was led by the Spirit of God into the lonely wilderness. There he lived by himself for forty days, among the wild beasts. But God did not allow any harm to come to him. And Satan, the tempter, found Jesus all alone in the wilderness. So he tempted him there. First in one way and then in another he tried to get Jesus to listen to his cunning plans and open his heart to let sin enter, just as Adam and Eve had done. But Jesus would not listen. When the forty days were ended, Jesus grew very faint and hungry, for he had eaten nothing since he came into this lonely place. And Satan remembered how he had tempted Eve to eat pleasant food, and how this temptation had caused her to listen to his words. He thought he would try the same temptation on Jesus. He said, "If you really are the Son of God, command that these stones become loaves of bread." He thought Jesus would surely yielded to this temptation and try to prove that he was God's Son. But Jesus answered, "Man shall not live by bread only, but by every word of God." Although he was hungry and faint, Jesus would not use his great power to please himself. He was willing to trust his heavenly Father to care for him in that desert place, and supply his needs as he had supplied food for Elijah. Satan soon saw that he could not cause Jesus to yield to such a temptation, so he tried another way. Taking Jesus to the topmost part of the temple in Jerusalem, he said, "If you expect people to believe that you are really God's Son you must show some great sign. Now cast yourself down to the ground, and trust God to protect you and keep your bones from being broken; for in the Scripture he has promised that angels will bear you up and not allow any harm to befall you." Even though Satan used Scripture words to urge Jesus to do this foolish deed, yet Jesus would not obey him. For Jesus knew that the Scriptures had forbidden any one to tempt God in such a foolish manner and expect God's angels to help him. And again Satan saw that his plan had failed. The third time Satan brought his greatest temptation. He took Jesus to the top of a high mountain and caused him to see all the kingdoms of the world. "These great kingdoms are mine," said the tempter, "and I can give them to any one I choose. Now I will give them to you if only you will fall down and worship me." But Jesus knew that Satan's words were not true. He knew that Satan had told falsehoods to Eve in the beautiful Garden of Eden. Now he said, "Get away from me, you evil one! For it is written in the Scriptures that the Lord God is the only Being who should be worshiped." Then Satan left Jesus alone; for he could find no way to crowd sin into the pure heart of the Son of God. And when he went away the angels came from heaven and supplied Jesus' needs. How they must have rejoiced because the Savior had gained such a victory over the evil one! And Jesus was tempted in very way that people on the earth are tempted; still he did no wrong. By his temptations he was made to understand how people feel when Satan whispers to theirs hearts and urges them to sin, and he understands how to help those people when they call upon him in prayer.